It's small, fast, and portable. But makes you look like a prat. If you've enviously watched Casey Neistat navigate the streets of Manhattan on an electric Boosted Board, secure in the knowledge that if you so much as looked at one you'd break your neck, this may be the next best thing. It has a handle for a start, so it's much harder to fall off. We've seen a big rise in electric personal transportation being used as 'last mile' vehicles recently, whether it's bikes, hover-boards, skateboards or scooters. The idea is that you drive to the station, get on the train, then scoot from the station to the office, for example. Keen to discover what all the fuss is about we picked up the eMicro One from Swiss brand Micro and used it to commute for a month. It’s a folding scooter, you may have had one as a child, but this one is designed for adults. The eMicro One packs a small electric motor and a battery, capable of propelling you along at 15 mph, which feels pretty fast on those tiny wheels. It's the sleekest electric scooter we've seen. That means while electric scooter usage on UK roads and pavements is a legal grey area, you're unlikely to be stopped due to its discreet design. The only thing the belies its electric secret is a audible whine from the engine. Thankfully, it's not an unpleasant sound. The eMicro One weighs 7.5kg, so while it's no lightweight, it's certainly more portable than other electric scooters we've seen. Inside the deck is a 2200 mAh battery connected to a 500 Watt electric motor. This powers the chunky rear wheel. There is no button or pedal to engage the motor, instead it's activated by you pushing forward, so it's electrically assisted rather than electrically powered. The harder you kick, the quicker and further you'll go, and once moving forward you can engage the motor by thrusting the scooter forward. The eMicro One also features an accelerometer, which senses when you're travelling up hill and increases the power and torque to compensate. There are three modes, Eco which has a top speed of 15 km/h, Standard which uses 250 Watts to reach 25 km/h, and a Sport mode which uses all 500 Watts to reach 25 km/h. 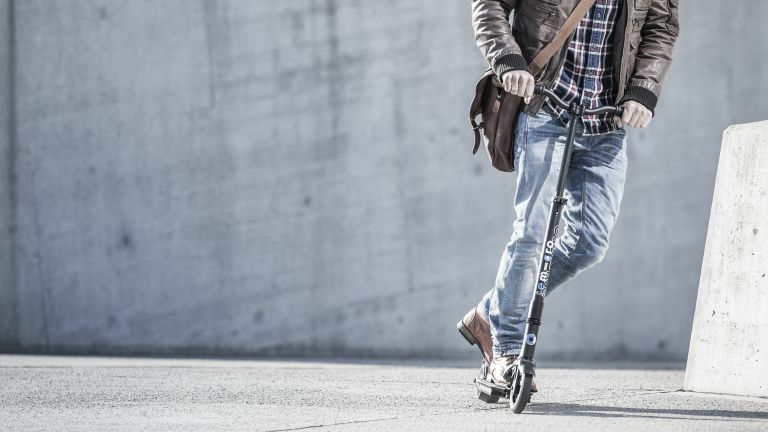 The range is between 6 and 9 miles, and can be recharged from 0-100-percent in just one hour, but the scooter also uses regenerative breaking to recover charge when slowing down. It's faster than walking, safer than a bike, and cheaper than the tube. We were seriously impressed with how fast we could get around London. Travelling to meetings and lunches was a breeze (once you get over the fact you look like a bit of a bellend). Once we arrived at our destination the scooter is easy to fold up and stash under a table or in a cloakroom.